What conspires to make Japanese seem so unhappy? What do Japanese have to be so unhappy about? In the 2017 World Happiness Report, Japan ranked 51st on the happiness scale, sliding in between Belize and Lithuania. Among rich and advanced nations, only South Korea ranked lower at 56th. Rounding out East Asia, Taiwan was happiest at 33, Hong Kong was 71st while China was the laggard at 79th. Is there a Confucian values factor at work? There are endless scholarly debates about whether culture skews the results of such international comparisons based on survey data. For Japanese, I wouldn’t rely on self-assessments about happiness because for all sorts of reasons they would respond less positively, so the results should be taken with a grain of salt (or a dash of soy sauce). People around the world will vary in how they interpret or respond to the same questions because of differences in accumulated experiences and knowledge. And respondents will vary in their interpretations of wellbeing based on objective data because such assessments are refracted through different prisms. What is clear from the survey is that money is important to secure a certain level of happiness, because if you can’t afford to put food on the table or pay your rent, it’s hard to be happy. Do Japanese take many of the wonderful things about their country for granted? Generally, people focus on problems and what makes them unhappy. The world envies Japanese because they get to eat Japanese food all the time. Tokyo is the global mecca among gourmet grazers because it boasts more Michelin stars than anywhere else, but even “average” eateries are incredible. For sushi lovers, ramen slurpers or tofu aficionados it doesn’t get any better. Japan also has one of the safest and most polite societies in the world, and offers an incredible level of service. And let’s not overlook a vibrant and varied cultural scene, superb skiing and hiking with ethereal scenery, and excellent transport systems. It’s true that natural disasters are too frequent, and that may depress the happiness quotient, but where else would you want to be when cataclysm strikes? Japan hasn’t quite mastered the art of work-life balance — there’s too much of the former without enough of the latter. Excessive hours of work and commuting mean couples and families don’t get to spend enough time together or share household duties, and when they are able to do so, there is the fatigue factor to contend with. Working hours may be excessive and unpaid overtime way too common, but if you can put up with the drudgery, job security is strong provided you don’t share the unhappy lot of the “precariat” of nonregular employees — now comprising almost 40 percent of all workers — who in general are poorly paid, easy to terminate and consigned to dead-end careers. People are despondent, as reported in a recent government survey: 25 percent of adults have considered committing suicide, up from 19.1 percent in 2008. It is encouraging, however, that the number of suicides in 21st century Japan has declined from an annual 30,000 to just over 20,000, suggesting advances in diagnosis and treatment of depression. Maybe it’s hard to be happy about something that could have happened a long time ago. It seems that Japan enjoys relatively strong community bonds and a high level of social cohesion, factors that should boost a sense of wellbeing. Again, maybe Japanese take this for granted because they don’t benchmark themselves against norms in the U.S. or Europe. Are close-knit local ties taken for granted or could the low happiness ranking signify that such bonds are frayed and unraveling? There is wide variation between people living in massive anonymous housing complexes and neighborhoods dominated by individual homes where neighbors regularly interact, while isolation is a problem in thinly populated rural areas, especially for less mobile older people. Another possible happiness killer could be the aging of society as the elderly confront health and financial woes. Male retirees can find the transition away from being worker drones very difficult because they haven’t nurtured networks outside of their jobs and are often strangers in their neighborhoods and, in some cases, their families. And then there are the “happiness-busters” in government. Is there a misery index tied to red-tape obstructionism? 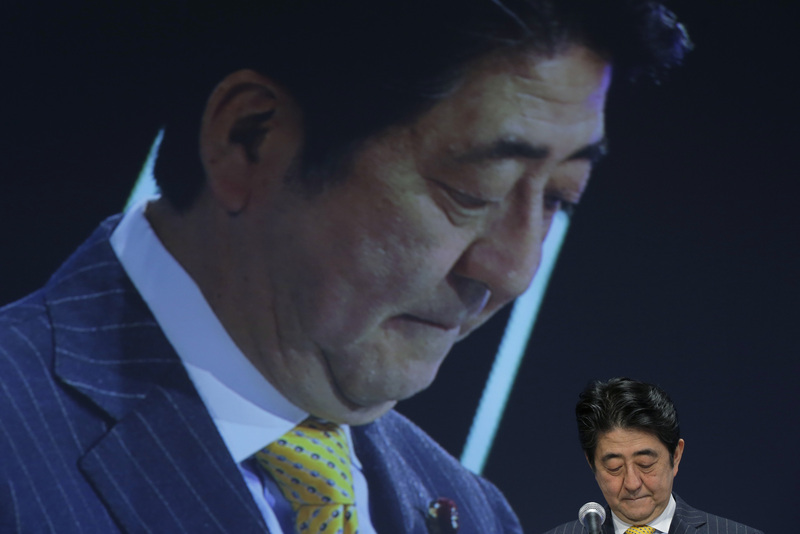 The prime minister’s Abenomics growth formula has proven to be a dud for most Japanese and there is relatively low support for virtually every one of Shinzo Abe’s other signature policies, ranging from nuclear reactor restarts and secrecy legislation to easing of constitutional constraints on Japan’s military forces, legalizing casinos and ongoing moves to enact conspiracy legislation. Regarding the latter folly, the government claims it needs to give itself expanded police powers to sign the International Organized Crime Convention, but that is untrue; any country can sign and ratify a treaty subject to reservations, as Japan has done with the U.N. Convention on the Elimination of Racial Discrimination, where Japan absolved itself from adopting supporting legislation. It is also invoking the 2020 Olympics to justify augmented powers that it says are crucial to combat terrorism. This conspiracy law has long been on the government’s wish-list, but until now the Diet has demonstrated its wisdom by not approving a law that would undermine civil liberties and give the police carte blanche. 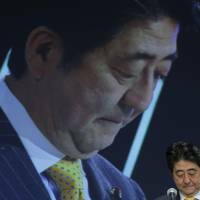 Team Abe is trying to reassure critics that it will act with restraint, while at the same time it is refraining from inserting language in the law that would mandate such restraint. Shouldn’t we be happy that the government pared down the list of conspiracy crimes from 676 to a paltry 277? Considering that the Supreme Court sided with the police in maintaining warrantless surveillance on Muslim residents of Japan without due cause, shouldn’t happy citizens trust the government to limit the scope of the new law to organized crime, even if it refuses to clarify that point in the legislation? Perhaps citizens worry that the state already abuses its powers — for example, by jailing and isolating Okinawan anti-U.S. base activist Yamashiro Hiroji, 64, from October 2016 to March 2017 on trivial charges. It may seem like arbitrary arrest and a vindictive attempt to silence protesters by making an example of a defiant citizen, but why would this travesty of justice make anyone conjure up conspiracy theories about police irresponsibly using the new powers the conspiracy bill grants them? Perhaps criminalizing skepticism is next.